With social media being one of the largest drivers of traffic today you either become a player in the game or miss out on a huge opportunity for your brand’s recognition and sales. A common complaint many of us have in the social media landscape today, however, is there are just too many social networks and not enough time to keep them all updated and engaged properly. This is where social media management tools can come to the rescue and for Twitter, we have Social Dog. This service helps with all the time-consuming tasks for Twitter such as gaining new followers and scheduling your tweets. In turn, these can help increase your engagement rates. Social Dog also provides in-depth Analytics for your Twitter account and users. Wouldnt it be nice if you were notified whenever someone retweeted or replied to one of your tweets? Social Dog does this and also keeps track of your followers with options to automatically communicate with them which can prevent you from losing them in the first place by helping to keep your Twitter account more active. Are you tired of surfing around Twitter trying to find the right kind of followers? 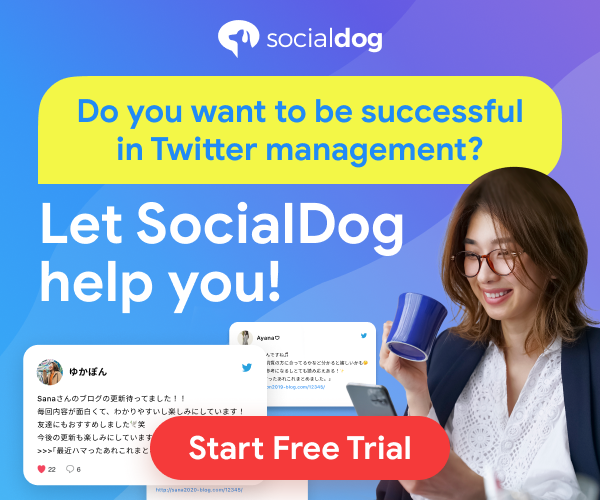 Well, Social Dog allows you to set the keywords to target thereby finding highly relevant people who likely already have an interest in the topic related to your Twitter account. A few of the more time-saving features of Social Dog are auto direct messaging as well as tweet scheduling. If you are someone with multiple Twitter accounts Social Dog will let you manage these under one central interface as well. Combine this with the many automated services they offer and you may even free up an hour or more of your time each day if you are currently a heavy Twitter user and do not use any automation tools at the moment. There really are too many features to list in Social Dog so you may want to go check them all out for yourself with their free $0-month plan which is a deal that is hard to beat. They also have options to upgrade to their tier 1 level premium service for just $7 a month or a professional plan for the heavier Twitter user at $15 a month down the road if you like the service. With social media automation services like Social Dog, there really are no excuses anymore to not run a highly engaged Twitter presence and grow your followers and brand to the next level while also freeing up your precious time in the process. It’s time to let the dog loose!